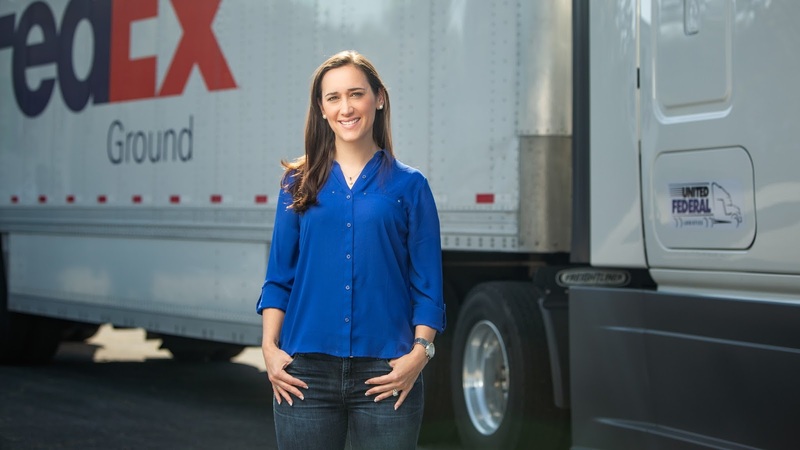 Fun Loving Jen: Introducing United Federal Logistics Inc. Introducing United Federal Logistics Inc. 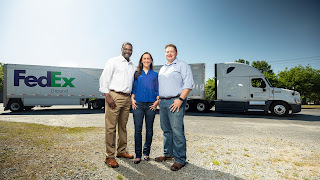 I have never written a blog post about our trucking company, United Federal Logistics Inc., that we started in August of 2015. My husband, Kyle, and I have grown our company from 3 tractors and 6 employees to 10 tractors and 20 employees. The reason I have been hesitant to share our story about our business is because this is my professional life and my blog has been mainly personal. This has been my dilemma. I was recently encouraged by our photographer, Jerry King, to share our story. He thought we could inspire potential new business owners. By starting our company, Kyle and I took a huge leap of faith in God’s promise to trust in Him. After a lot of prayer, we felt the Holy Spirit direct us to “give God a chance to work in our life” in a tangible way. We just had to take "one step in faith" at a time. In my other posts, you have seen my story about losing my mom in April of 2015. After this major tragic event that intersected with my life, I started to view my time in a different and in an urgent way. I realized when I was older, looking back, I wouldn’t want to have any regrets. This included helping, supporting, and partnering with Kyle to live out his dream of owning his own business. He received his Master’s in Business Administration from Emory University to prepare for this dream as well!! Kyle discovered the FedEx Ground linehaul contractor model in 2012. 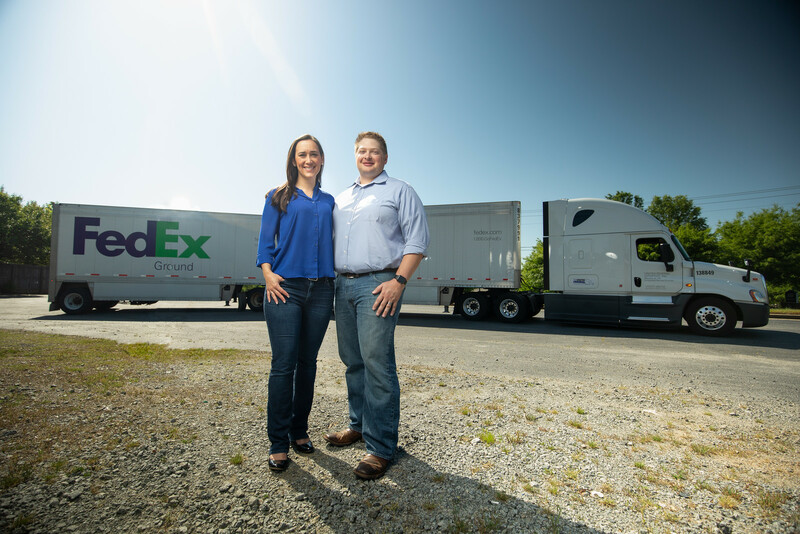 FedEx Ground outsources it’s linehaul and pick-up and delivery services to independent business owners and logistics companies. He realized it was a great opportunity and thought it might be something that he would like to pursue. He spent over a year researching and modeling out the business. We made a few attempts to start a linehaul business with FedEx. Then we had divine timing as we finally got the first 3 routes. FedEx wanted our business up and running and available to work within a month. So we needed to act quickly! We worked hard to secure tractors and hire drivers to get fully staffed. Since then, we have had many ups and downs, as any business does during the start up phase. 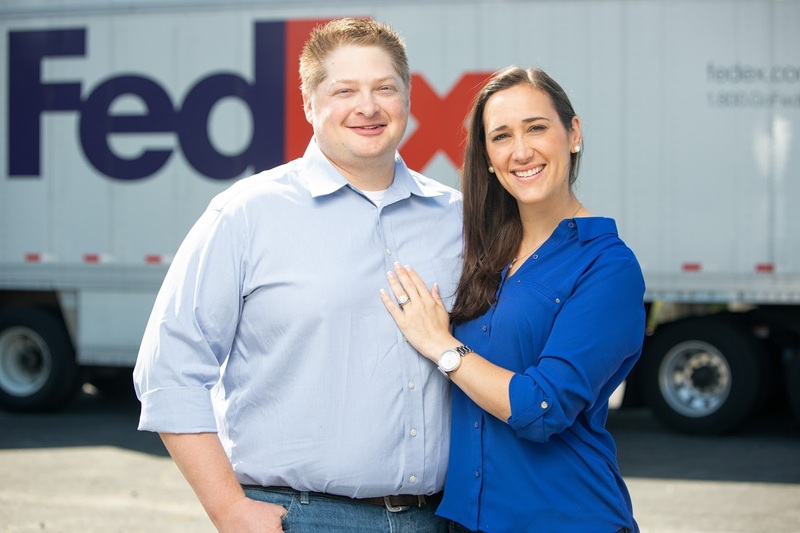 We have continued to organically grow our business and our partnership with FedEx Ground. Kyle was handling all the logistics of day to day coordinating of runs, tractor maintenance, and reporting all by himself for about a year and a half. Then a year ago, we made a great decision to promote a seasoned top driver to management. Promoting Dale Moore has made all the difference for Kyle and the rest of the company. Dale has been crucial in helping us scale and manage the business as we have continued to grow. I still handle most of the back office operations, HR, finances, and driver benefits. Working with my spouse, as a business partner, has certainly had its challenges! We have grown and stretched our marriage, sometimes even to it’s limits. It is kind of like the process taking a piece of coal and under stress refining it into a diamond. Many people tell me they can’t imagine working with their spouse because of how difficult it would be. They are right, it can be very difficult! But, it has always been worth it!!! Our journey has revealed a whole new side of Kyle to me and what makes him tick. It has shown me his incredible strength and given me a greater appreciation for how brilliant he truly is. I respected him before and it has only expanded my respect for him as a business partner and leader of our company. God and the Holy Spirit get so much of the credit and glory!!! God has been there the whole time giving us guidance and showing us that if we are faithful with the small things he will bless us with more. He also comforts us when we are going through difficult times. Keeping the Lord at the center, as our Rock, has made all the difference! We always wanted to be the type of bosses for which people like to work. We strive to provide a great work/life balance for our drivers. 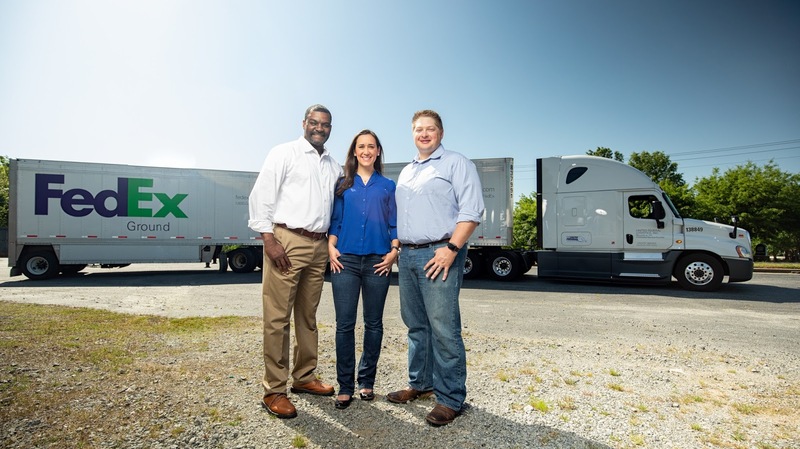 We know truck drivers will work somewhere, and we want them to be happy working for us! We know linehaul drivers have a life and we work with them, so they can still be home for important events at home. We really care about our drivers as people not just employees. We also show them that by offering full health care benefits and paid time off. We know rest and self-care is so important for drivers and their safety on the road. Safety has always been our number one priority. Everything we do comes from that mentality. Pray about everything and for God’s direction!! Don’t be too proud to get on your hands and knees surrendering everything to God’s ultimate control. Trust your instincts and the Holy Spirit. Take a leap of faith and one step at a time. Be willing to put in the work to see things through to completion. Be quick, nimble, and try to make good decisions under pressure. If the decision doesn’t happen to be the right one, learn from your mistake, and move on to the next decision. Make sure to have a lot of perseverance and faith that no matter what happens it will be okay. You will have to work harder than you would for someone else. You have to be willing to do whatever it takes if no one else will. You have the flexibility to make your own schedule but have to be a great self-starter. Have wise counsel you can talk to about decisions by getting outside input and perspectives. You have to be willing to take responsibility for how things turn out because the burden falls on you. Running your own business is a life style change and not for the faint of heart!! Being your own boss and working for yourself is so rewarding!!! Labels: CDL, Commercial Drivers License, FedEx, FedEx Ground, FedEx Ground Linehaul Contractor, Linehaul, Over the road, Truck Driver, Trucking, Trucking Company, Trucking Jobs, United Federal Logistics Inc. Wonderful! Wishing you much success. Your story is so Amazing. I'm so proud of you both. Kyle I am so happy for you and Jen, congratulations and keep trucking! Jen, Great blog..very well thought out and written. I enjoyed reading the entire story of how you got started and your words of advice. This blog was so encouraging. It's so good to hear owners give God the glory for He has done. This is awesome! I really appreciate you reading my blog!! I try to inspire you to be the best person you can be, overcome your own obstacles, and live the best possible life. I wanted to give a shout out to the people reading my blog overseas in Russia, Germany, United Kingdom, Canada, Poland, Latvia, India, France, Australia, Mexico, Brazil, Netherlands, Sweden, Czech Republic, and China. Please note you can translate to your own language!! You inspire me to keep writing and share what American women experience. Life is short, so live your life to the fullest with out any regrets. You will be more disappointed later in life about the things you didn't do rather than the things you did. Take chances, and step out in faith trusting the Lord is with you always!! We should all live to love the Lord and your neighbors! “Consider it pure joy, my brothers and sisters, whenever you face trials of many kinds, because you know that the testing of your faith produces perseverance. Let perseverance finish its work so that you may be mature and complete, not lacking anything.